Abstract:� This innovative project is the first comprehensive, high resolution airborne mapping of sky and ground brightness due to artificial light at night (LAN), of a major urban area.� This rigorous, science-based program will yield a unique LAN baseline map, as well as a five-year follow-up data archive applicable to monitoring changes due to growth and lighting installation changes. The Light at Night Mapping Project (LAN MAP) is a unique program to address this problem.� The prototype LAN MAP project is focused on the Tucson, AZ urban area as a demonstration of the utility of actual measurement of community wide lighting output, and is known as LAN MAP 1. The LAN MAP 1 survey region is shown in Figure 1.� The data collection from aircraft will be at an altitude of 8000ft MSL.� This will allow safe clearance of the mountains in the flight operations area, and will provide data also relevant to many astronomical observatories in the surrounding area.� The airborne data will be supplemented by both mobile and static ground-based data.� These data can be used to scale the airborne observations to comparable ground intensities and allow for future comparisons from ground based measurements. Each survey session will be repeated on a quarterly basis for the projected five year duration of the project resulting in the most detailed and comprehensive LAN survey analysis yet undertaken. We will also obtain limited ground based photography of some of the installations, both to illustrate the good and bad installations and to show the changes in lighting over the project time line. Data Analysis:�The baseline and follow-up data sets will be used to form ratios of values, and these data will be converted to a 3-D isophotal array for display on a Google Earth overlay plot.� This will provide both tabular and visual data to make quantitative representations of the magnitude and location of sky brightness changes attributable to evolving lighting systems, as well as multi-spectral maps of the underlying ground lighting. An integral part of this project will be the development of application specific tools (including software and algorithms) for the analysis and interpretation of� the novel multi-dimensional/multi-spectral LAN data. These analysis protocols will form the basis for a standardized approach to the evaluation of LAN in response to public policy lighting codes. Applications of These Data: �The baseline data should be collected as soon as possible.� These data provide an averaged, area-wide, quantitative foundation against which to compare future change.� Follow-up data will be acquired quarterly. The follow-up packages will allow computation of the parameters describing evolution in sky brightness due to lighting changes made since the acquisition of baseline data, as well as properties of lights on the ground.� Note that we will document all major changes in the study region, not just those that may be due to a specific development.� ����� This utilitarian and quantitative approach to monitoring the environmental impact of lighting could become a standard model for future development enterprises, and could significantly aid the realistic preparation of environmental impact studies. The Project Team:� STEM Laboratory, Inc. will bring a strong, dependable team to this project.� Project personnel include professional scientists with decades of experience in managing and conducting a range of scientific programs, engineers with experience in instrumentation design and implementation, and aeronautical engineering.� We have at least two experienced pilots dedicated to the program, and we have a research associate on the project who has many years of experience with sky brightness and quantitative lighting measurements.� This team has pioneered techniques of airborne light measurement, and it has a reputation for performing its projects on time and within budget.� See Appendix 1 for an indication of past short-term lighting measurement activities. Project Costs:� The STEM Laboratory, Inc. budget is projected at $3.8M for the five year LAN MAP project. �A critical goal for the first year is early and rapid collection of a complete baseline data set. Note that STEM Laboratory, Inc. is an IRS registered 501(c)(3) not-for-profit corporation, and any donations to STEM Laboratory, Inc. may be tax deductible. Craine, ER, Craine, EM, and Craine, BL �The sky brightness data archive (SBDA)�, Proc. SAS, 45-52 (2011). 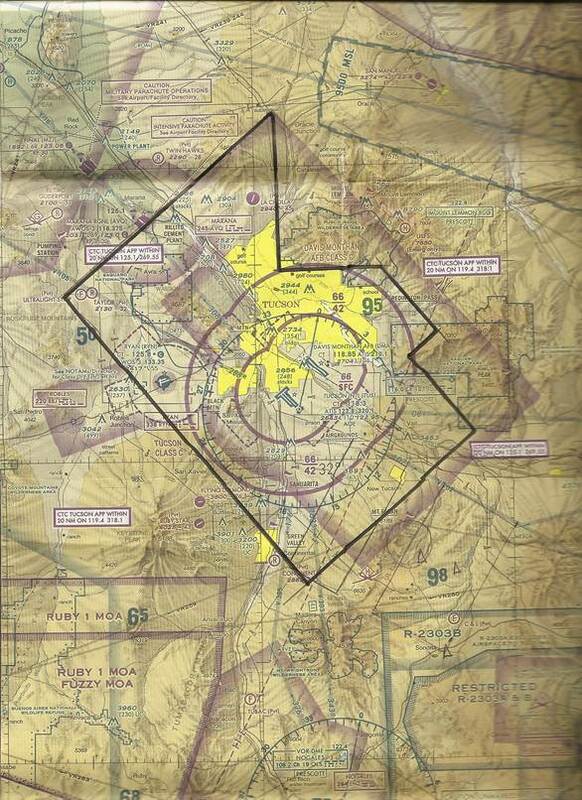 Figure 1.� FAA Aeronautical Chart, Phoenix Sectional, Tucson, AZ surroundings, showing the LAN MAP 1 flight grid throughout the Tucson basin.